Like many of you, I love to read. Part of the problem of attempting to be an active writer is that much of my reading time is consumed by writing time. My wife and I have end tables on either side of our bed, and they are always stacked with books. Some in progress, some on deck, and some read that need to be shelved. I don't often do book reviews as part of my blog, but a book I recently read begs to be talked about a bit. 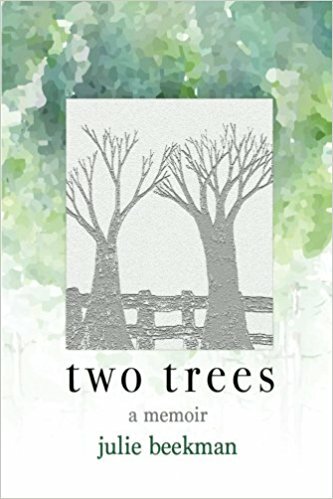 The book is titled, Two Trees, by Julie Beekman. Julie is a friend and, in case you were wondering, did not put me up to this, nor ask me to review her book. I've really only met her a few times, usually at a writing retreat offered by AllWriters. But I can tell you from those meetings that her laughter and presence can light up a room. Her book details her young life as an adopted child. The story goes south when her adoptive father dies and her physically and mentally abusive mother raises her and her three step brothers. Without giving it all away, one of her step brothers inflicted their own harm and the other two were no saints either. The thing about this book is, just when I thought things were going to start turning out better, something more shocking happens. A couple of times I had to stop reading and tell my wife. By listening, she helped me work through the pain of it. I think the fact that I know Julie made it more difficult to read without being impacted. If it was someone else, I'd still be shocked, but not to the point of being emotionally impacted and upset. Twenty pages into the book I told Julie I just wanted to hug her past right out of her. None of this is to say that the book is a complete downer. It most certainly is not. Rather, it is a story of redemption, perseverance and the strength of the human spirit. Knowing Julie today is proof of that. Fortunately, she had some angels in her life that helped her work through a lot of her situations. These people serve as glimmers of hope throughout the latter half of the book and kept me reading in the hope that justice would be served. The book also made me look at my own childhood a bit. We had a fair amount of tragedy in our family in the early years -much of which I was too young to understand at the time- but none of it was abusive. My mother was a hero on the order of Julie, I guess you might say. She pulled us through the tough times and had a few angels herself. 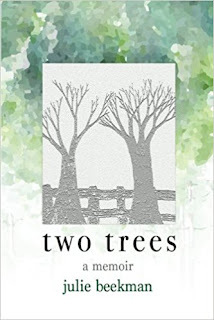 Reading Two Trees reminded me that everyone has a story. Sometimes they are happy, other times they are brutal. Often times they are a mixture of both. But it is who we come out as in the end that matters. Last Of The Aging Rockers - 2017 ed. On The Edge Of An Empty Nest.